Compromising on space at the wash basin is a thing of the past. The hansgrohe Metris mixer range provides an unprecedented sense of spaciousness in the bathroom, outstanding ease of use and excellent sales opportunities for you. 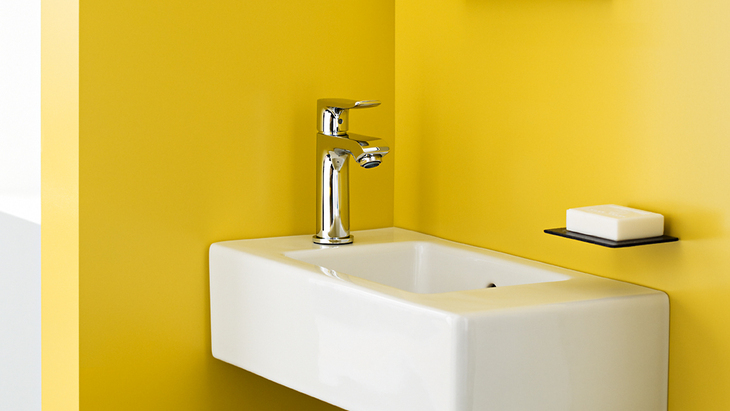 The Metris range is minimalist in design and will fit in perfectly in any modern bathroom. Metris mixers are economical and environmentally friendly: thanks to automatic water volume restriction of 5 litres/minute with EcoSmart and CoolStart technology. Find the perfect ComfortZone for your customers. Mixers in hansgrohe's Metris range come in various heights, as single lever mixers or as 3-hole basin mixers. The range is supplemented by variants for wall mounting. For the bath tub, the Metris mixer range offers exposed and concealed single lever bath mixers, and 3 or 4-hole mixers for the bath tub rim. Regulate your shower water in contemporary style: with exposed or concealed single lever shower mixers. Or alternatively with stylish shower thermostats. Timeless clarity in the bathroom: This geometric hansgrohe mixer range concentrates on the basics. Metris S mixers look impressive on wash basins, bath tubs, showers and bidets. Thanks to EcoSmart, they are also economical to use. Your customers can choose from numerous single lever mixers, rim-mounted bath mixers and models for wall mounting.